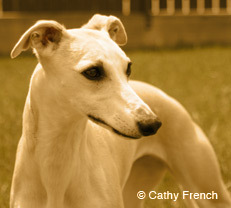 The National Whippet Club of Canada was formed in 1992 and received official Club recognition from the Canadian Kennel Club (CKC) in 1993. 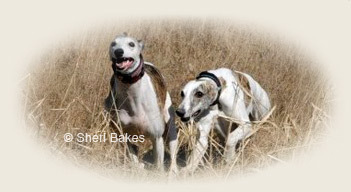 We promote activities pertaining to the Whippet breed across Canada, including racing, showing, lure coursing, obedience, rally, flyball, agility and any other activity that may be undertaken with Whippets. We encourage members to respect and adhere to the breed standard as approved by the CKC, promote health testing and breed education. Our country-wide Whippet Rescue network is of paramount importance. 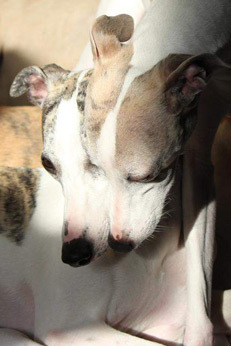 We aim to unite Whippet enthusiasts from coast to coast for mutual support and benefit of the breed. So why should you become a NWCC member? 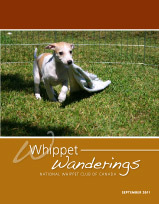 The NWCC publishes an informative newsletter, Whippet Wanderings, four times a year. Our newsletter contains regional reports, member ads, show, racing and coursing results and statistics and informative articles and information of interest to whippet fanciers. Want to receive Whippet Wanderings? There is a deadly disease stalking your dog: a hideous, stealthy thing just waiting its chance to steal your beloved friend. It is not a new disease, or one for which there are inoculations. The disease is called TRUST. You were told before you took your dog home that it could not be trusted. The adoption group, who provided you with this precious animal, warned you, drummed it into your head. Soon, it becomes second nature to make sure the door closes nine tenths of a second after it was opened and that it really latched. “DON’T LET THE DOG OUT” is your second most verbalized expression. (The first is, “NO!”) You worry and fuss constantly, terrified that your darling will get out and a disaster will surely follow. Your friends comment about who you love most, your family or your dog. You know that to relax your vigil for a moment might lose him to you forever.